There is a popular notion out there which seeks to reason that Ghanaians in some sectors of our economy are not hard working. This may not be the whole picture due to the plethora of research on depression and its adverse economical effect in countries where mental health receives little attention. Depression is not a popular health topic among Ghanaians. It, however, has a huge socioeconomic impact in our society and nation-building. Depression is a common illness worldwide, with more than 300 million people affected. Depression is different from usual mood fluctuations and short-lived emotional responses to challenges in everyday life. Especially when long-lasting and with moderate or severe intensity, depression may become a serious health condition. Both Ghana and Malaysia are celebration 62 years of independence this year. Being an eye witness to life in both Malaysia and Ghana, I have no doubt the system of governance and output of workers may be the most important difference between these two countries. Talking about the output of workers, it is interesting to note that the condition of depression can cause an affected person to suffer greatly and function poorly at work, at school and in the family. There are several factors which determine workers output in any giving economy. It is however undeniable that the economic progress of Ghana, lagging behind a counterpart like Malaysia may partly be due to little attention giving to the mental well-being of workers. At its worst, depression can lead to suicide. According to the World Health Organisation (WHO), yearly suicidal cases is about 800 000. Suicide is also the second leading cause of death in 15-29-year-olds which forms an important force of any economy. People with depression may present with depressed mood, loss of interest and enjoyment, and reduced energy leading to diminished activity for at least two weeks. Many people with depression also suffer from anxiety symptoms, disturbed sleep and appetite and may have feelings of guilt or low self-worth, poor concentration and even medically unexplained symptoms. An individual with a mild depressive episode will have some difficulty in continuing with ordinary work and social activities, but will probably not cease to function completely. During a severe depressive episode, it is very unlikely that the sufferer will be able to continue with social, work, or domestic activities, except to a very limited extent. There are effective treatments for moderate and severe depression. Health-care providers may offer psychological treatments such as behavioural activation, cognitive behavioural therapy, and interpersonal psychotherapy or antidepressant. 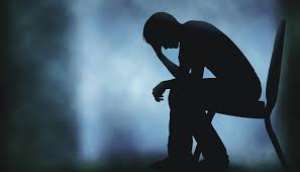 There are however several barriers to treatment of depression in Ghana. Barriers to effective care include a lack of resources, lack of trained health-care providers, and social stigma associated with mental disorders. Another barrier to effective care is an inaccurate assessment. There are reports of misdiagnosis with incorrect treatments given in this part of the world we find ourselves. Ghana as a country can embark on preventive programmes at various levels of our society to reduce depression. The World Health Organisation prescribes effective community approaches to prevent depression which includes school-based programmes to enhance a pattern of positive thinking in children and adolescents. Interventions for parents of children with behavioural problems may reduce parental depressive symptoms and improve outcomes for their children. Exercise programmes for the elderly can also be effective in depression prevention. Program content in radio, television and social media entertainment has been criticized by many. One of the criticisms is for the media to produce intellectual-stimulating programs which help in nation building. As much as intellectual-stimulating programs are important, the media also has a responsibility to entertain viewers, listeners, and readers. As far as depression is concerned; the humour in sports programs, movies and comedy shows in its appropriate forms are very essential to the mental health of Ghanaians. Life should not be taking too serious for 24 hours a day. As much as there is time to engage the mind in intellectual activities, there is also time to relax and have moments of a very good laugh. With a balanced life and the needed attention giving to this condition, I have no doubt that we as a nation can tackle depression to build our Homeland Ghana.